This page contains source code and corresponding screen dumps for programs I wrote in BASIC for the Texas Instruments TI-99/4A computer in 1982 and 1983. Chess-playing programs for two players. 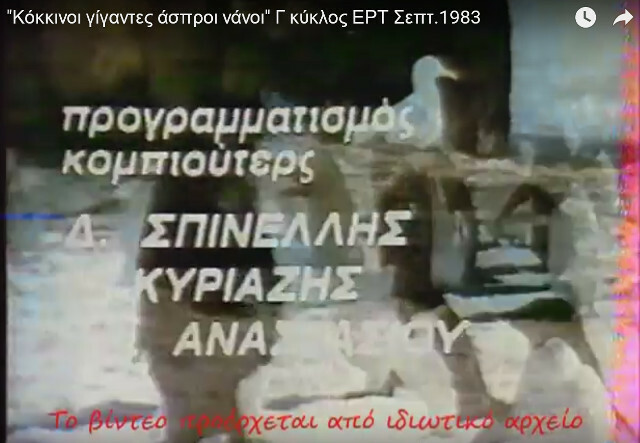 The TI-994/A was used for displaying the computer-generated screens of the first Greek TV programme to use computer graphics: "Kokkinoi Gigantes Asproi Nanoi". Its speech synthesizer was also used, adding a dramatic effect to the game. Source code: KOKAS.BAS, first prototype: DOK.BAS, second prototype: DOK2.BAS. Watch the TV show on YouTube. Painting program; Mac Paint was still some years away. The obligatory Greek font. Since the computer had only a character set with 96 characters only a few uppercase characters were reprogrammed. Source code: GREEK.BAS. Another approach was to reprogram all lowercase characters to a Greek font. Source code: SPEKGREK.BAS. A program to ask chemistry questions (valence values). Not quite eLearning. I guess I was just trying to avoid actually styding chemistry; programming was far more exciting. The TI-99/4A featured a speech synthesizer based on linear predictive coding and a three channel sound synthesizer. I wrote a small talking demo program to demonstrate its capabilites. People would crowd around its screen at exhibitions and fairs.